♥♥♥NOTE: Please Order ONE SIZE UP Than Your Usual Wear! Features: A-Line, Big Swing, Tea Length, Button Design. 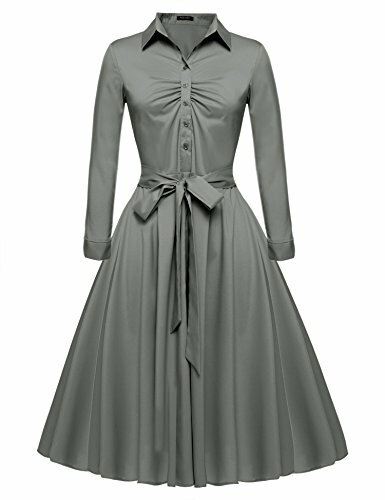 Vintage Dress, Formal Dress, Business Dress, Shirt Dress, Picnic Dress with Belt. Style: V Neck Collared Style is so Fashion. You Can Tie the Belt in Different Ways. Pleats at the Bust for a Beautiful Cleavage. Pair with a Pair of High Heels to Show Yourself. Occasions: This Swing Dress Suits for Casual, Wedding, Formal, Party and Business Events. Very attractive with simple earnings and necklace. US M------Bust 34.7''------Waist 28.5''-------Length 43.7''------Shoulder 14.4"-------Sleeve 22.2"
US L-------Bust 37.8''------Waist 30.8''-------Length 44.1''------Shoulder 15.2"-------Sleeve 22.8"
US XL--------Bust 40.6''-------Waist 33.9''-------Length 44.5''------Shoulder 16.0"-------Sleeve 23.4"
US XXL------Bust 44.1''------Waist 38.2''-------Length 44.9''------Shoulder 16.8"-------Sleeve 23.8"